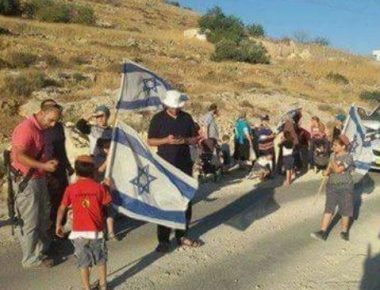 A group of Israeli colonialist settlers installed, Tuesday, an outpost on Palestinian lands in the al-Boweira area, close to the illegal Kharsina colony, east Hebron city, in the southern part of the occupied West Bank. Locals said the colonizers installed four mobile homes on the Palestinian lands, owned by several families, including Jweihan, Eada and Abu al-Halawa. They added that the Israeli assailants are trying to illegally occupy 70 Dunams of Palestinian lands, to build a new colony on top of a mountain that overlooks many neighborhoods in Hebron city. Several months ago, the colonists uprooted dozens of olive saplings, planted by the Palestinians from Eada family, on their own lands, in the same area.